Find our lowest available hotel rates starting from only $99. The annual Winter Festival of Lights in Niagara Falls has officially begun, which means that from November 3rd to January 31st, Niagara Falls and the surrounding parklands are illuminated in beautiful sparkling lights and exhibits. For a full list of this year’s illumination displays, click here. Spectacular fireworks will be launched over Niagara Falls every Friday night at 9pm during the festival. There will also be bonus shows every night from December 22nd – 31st to celebrate the holidays. 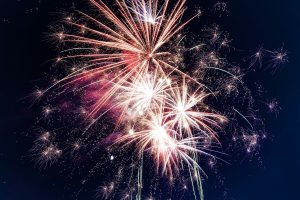 The Cascades of Fire International Fireworks Competition will also be taking place over two weekends in November, featuring 18-minute fireworks shows put on by six international teams. The musical lineup for this year’s Niagara Falls New Year’s Eve celebration in Queen Victoria Park has been announced and features an all-Canadian lineup of musicians including Burton Cummings, The Sheepdogs, Walk Off the Earth, and Niagara’s own Avenue Inn. In addition to an amazing outdoor concert, this totally free event will feature two fireworks shows at 9pm and midnight, along with an outdoor licensed area and food and beverage vendors. The annual Niagara Falls Winter Festival of Lights is an exciting holiday tradition that also includes the popular Deck the Falls Holiday Walking Tours where ticket-holders visit various properties throughout the tourist district for unique holiday experiences. You can experience all of the magic and wonder that this festival has to offer by booking your Niagara Falls winter getaway today! Enter your email address below to receive exclusive deals and promotions from Falls Avenue Resort. You may unsubscribe at any time by using the "Unsubscribe" link at the bottom of our emails. © 2019 Crowne Plaza Niagara Falls - Fallsview. This hotel is a Niagara Falls Hotel and located on Falls Avenue Resort.